Nye County School District students are learning a most important lesson beyond their regular curriculum that may save someone’s life one day. 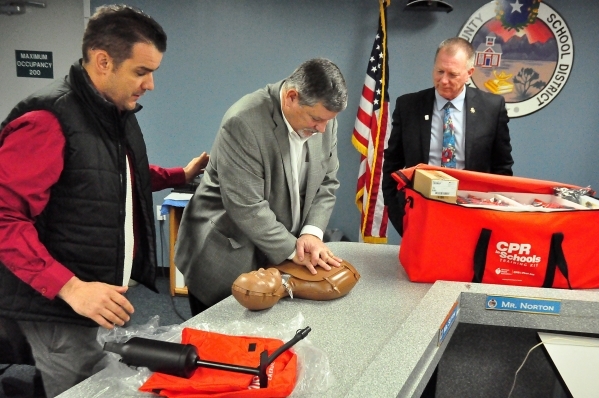 This month, the district received CPR kits which will be used by teachers to properly teach the district’s estimated 6,000 students lifesaving skills. District Superintendent Dale Norton noted the value of having the kits in schools around the state’s largest district by size. Each kit includes a facilitator guide, lesson plan, and a detailed how-to DVD, along with 10 inflatable CPR mannequins, during what is described as a 30-minute interactive, hands-on session. State Assemblyman James Oscarson said the process of acquiring the kits came during the 2013 legislative session. Ben Schmauss of the American Heart Association presented the kits at the Nye County School District office on Thursday. He too noted emergency response times in rural areas can be much longer than those in more populated cities. Schmauss also said teachers do not have to be CPR-trained to teach the procedure to middle and high school students. According to the American Heart Association, more than 326,000 people experience sudden cardiac arrest each year, which is the leading cause of death in the country. Statistics show that immediate, effective CPR can double or triple a victim’s chance of survival, but only 32 percent of cardiac arrest victims get CPR from a bystander, while less than 8 percent of victims survive, due to lack of CPR and Automated External Defibrillators used across the country. Schmauss said middle and high school students in Clark County are now receiving the CPR training, which has already made a difference. Additionally, Schmauss said there have been recent changes to how CPR chest compression are applied to victims. Schmauss also spoke about the correct amount of chest compression the patient should receive. He alluded to a popular 1970’s disco hit by the Bee Gees. Oscarson, meanwhile, said he is looking to build on the partnership established between the school district and the American Heart Association.